I don’t like to preach about current events. I’m much more interested in the timeless truths of the Gospel than the fleeting nature of the daily news. I’d rather tell you about Jesus than talk about the latest political crisis or natural disaster. It’s not that I don’t think we have a responsibility to stay informed. And I know for certain that the timeless truths we find in scripture apply directly to our everyday lives. Looking at the evening news through the lens of discipleship is a great exercise for small group discussion, helping us to determine what it means to follow Jesus through the events that shape our culture and our lives together in this community of faith. When this week’s news brought us those alarming images of a church surrounded by police tape and the faces of nine people who died there, my first impulse was to just work this into the pastoral prayer. After all, the bulletin was already printed. The scriptures were already chosen. The songs and hymns had been selected weeks ago. There wasn’t time to change gears. It seemed the simplest thing to do was add our prayers to those of people everywhere, prayers for comfort to the grieving, prayers for justice, for God’s Kingdom to come and put an end to hatred and killing. But my clergy colleagues wouldn’t let me get away with that. Everywhere I looked, there were resources for addressing the tragedy of Wednesday night through the scriptures that we already had in place. Everywhere I checked, there was another reminder that God’s Word is alive and active, speaking into our human condition in every circumstance. And everywhere I looked, there was the call from my brothers and sisters of color to preach to my white brothers and sisters about the evil of racism, an evil that will not go away. But racism isn’t a problem here, where 97% of the population identifies as “white,” right? Maybe it’s a problem in those places where ethnic diversity is higher, and racial tensions have a tendency to escalate – but we don’t have trouble with racism here, do we? As we look at the scriptures assigned for this day, we see that they do speak to the events of this past week. Let us attend to what God is saying to us, especially in today’s gospel passage. First, let’s remember the setting. Jesus has been teaching all day. Mark tells us that the crowds were so thick along the shore that Jesus “got into a fishing boat and sat in it out on the lake, while all the people were along the shore at the water’s edge.” (4:2, NIV) He’s been sitting in this boat through the morning, through the noontime, and into the afternoon, telling parable after parable about the Kingdom of God. He has told stories about planting, and lamp stands, and weed seeds that grow uncontrollably. 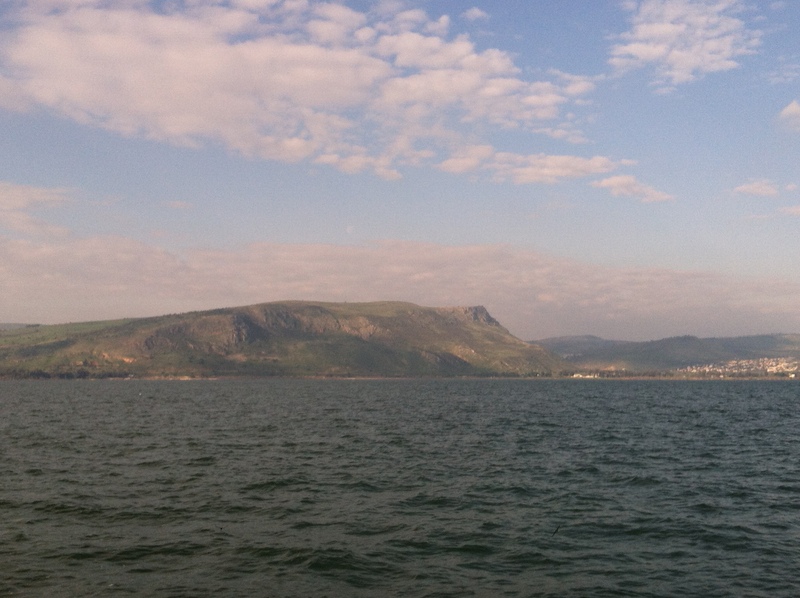 Now it is evening, and the crowds are still thick on the rocky shore of the Sea of Galilee. They show no sign of leaving. As long as Jesus is there, they want to be there, too. They don’t want to miss a single word he might say to them, even though they don’t understand half of it. The disciples experience two kinds of fear in this passage: the natural fear of a raging storm, and a holy fear of the one who calms that storm. How is natural fear different from holy fear? We’re all familiar with natural fear. It’s the anxiety that rises in us when we are faced with things we can’t control. Natural fear takes over our imaginations when we bump up against the unknown and unexplainable. We fear the possibility of death, because we have no direct knowledge of what lies on the other side of it. We fear challenges to our established understanding of how the world works, and what our place is in that established order. We fear change, because we know it means loss, and we are afraid of losing what is dear to us. We are afraid of pain. Yet, holy fear recognizes the power of God at work, even in the face of the unknown, the unexplainable, the uncontrollable. Holy fear sees God’s presence in change, and pain, and even death. Holy fear reminds us that God’s ways are too wonderful for us, and it fills us with awe at the immensity of God. In this short story about a boat ride on a big lake, we are caught up in the fear of the disciples, a fear that changes swiftly from natural fear of a storm to an awesome recognition of God’s presence with them in the person of Jesus. The story unfolds in three scenes. First, we have the boat ride. Whenever Bruce and I visit his brother in Michigan’s Upper Peninsula, we look forward to that time just before sunset, when Mark takes us out for a ride on his pontoon boat. Twenty years ago, we were more into the speed boat option, hauling the kids behind the boat on an inner tube or skis, but now the kids are all grown, and they can afford their own speed boats. Now we putter around Lake Mary, admiring the shoreline, waving at the neighbors. 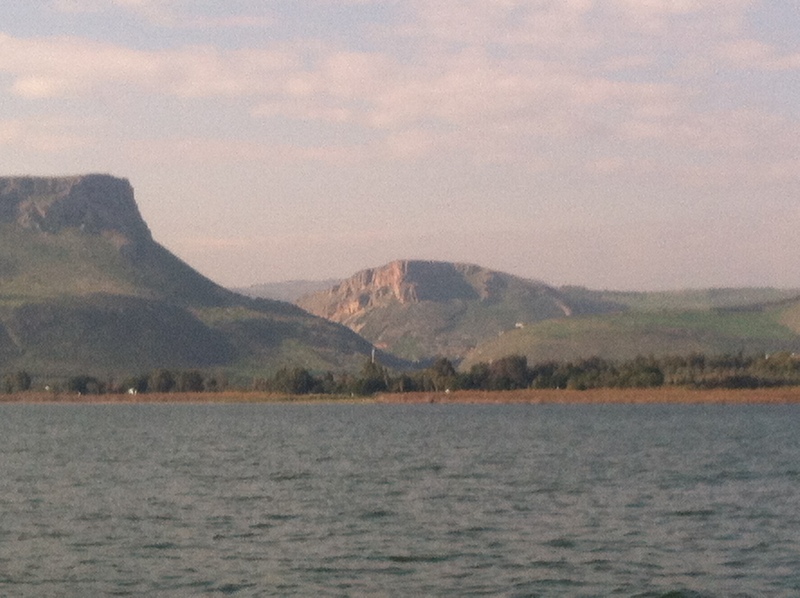 It’s a far cry from the boat ride Jesus proposed to his disciples on the Sea of Galilee. 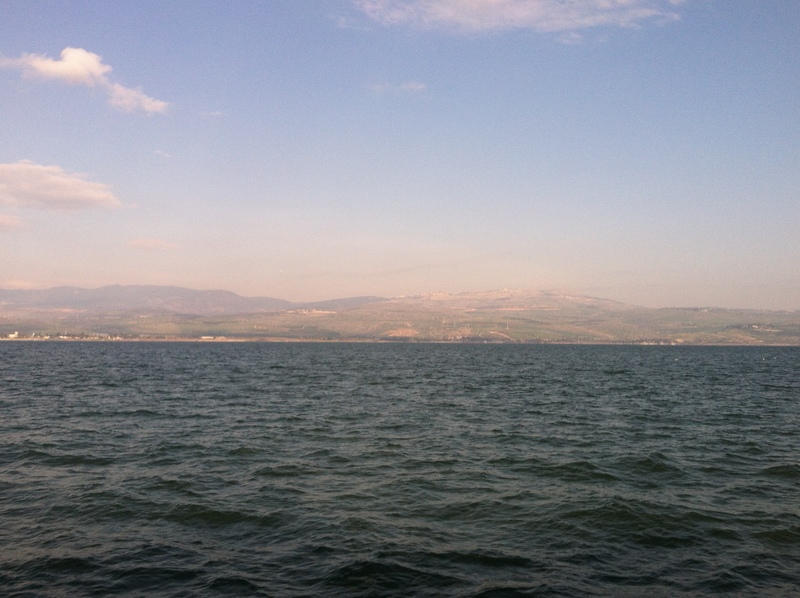 Because the Sea of Galilee lies approximately 700 feet below sea level, the climate around the lake is unusually temperate – except when the wind comes rushing down out of the Valley of Doves. And the time of day when this is most likely to happen is in the evening. Even when a storm comes over the lake at sunrise, the lake remains relatively calm. It’s the evening storms that are dangerous. And we should pay attention to the fact that this is precisely the time of day when Jesus sends his disciples across the lake. If the disciples sailing the boat had had their way, they’d have stayed near the shoreline. Though you can see the shore from every part of the lake, and it’s small enough that a strong swimmer could easily swim across it, hugging the shoreline is still the safest way to travel at evening. The disciples were familiar with this lake. They knew what it was like to be caught out on the water in a sudden storm, and they also knew that it was safer to stay near shore, where they could get to land in a hurry. Heading out across the lake at the very time of day when a storm was most likely to occur was just asking for trouble. Yet, that’s exactly what Jesus did. And it is exactly what Jesus does in our lives. He sends us out in the most dangerous direction, at the most dangerous moment. But notice that Jesus is already in the boat. When Mark tells us that the disciples took Jesus “with them in the boat, just as he was” we remember that Jesus has been in this boat all day, teaching from the water to the crowds gathered on the shore line. When Jesus sends us out into the deep water, where danger waits for us, he’s already in the boat with us. This is when we remember that another name for Jesus is Emmanuel, God With Us. Listening to the survivors of this week’s shooting in Charleston, South Carolina, as they addressed the suspected shooter, was a humbling experience. I’m not sure I could act with as much grace and love as they showed to this young man, who spent an hour in their midst before he opened fire at Emanuel AME Church. Their witness that God is still with us, even as they mourn the loss of nine lives, is powerful. This church, Emanuel African Methodist Episcopal, stands as the oldest Black congregation in the United States. When the church was burned in 1822, after members were tied to a slave revolt, the church stood firm. When Black churches were outlawed between 1834 and 1865, this congregation continued to worship together underground. Through every danger and challenge, “Mother Emanuel” has stood as witness that Jesus does not leave us to face the storm alone. God is with us. God is still with us when the storms rise unexpectedly and violently, seeming to come out of nowhere. 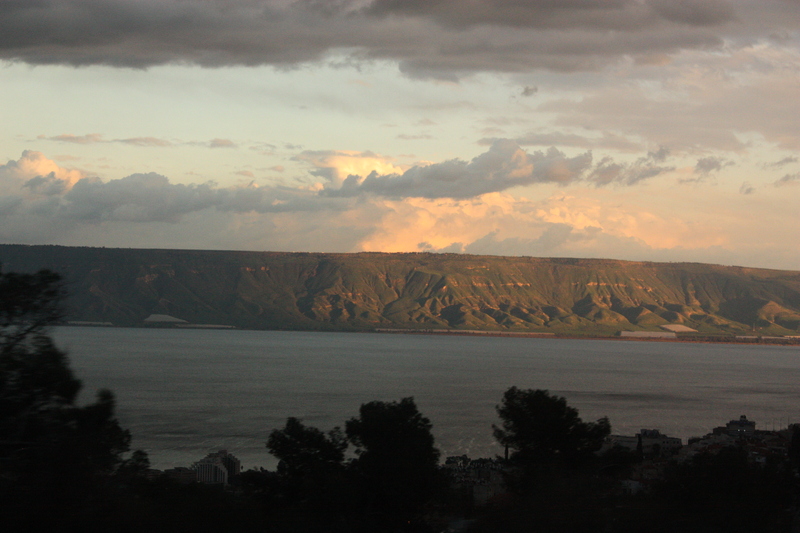 On the Sea of Galilee, the storms rise quickly, but everyone knows where they come from. The winds come whipping down from the Valley of Doves onto the water with great force. You can see this valley from anywhere on the lake. 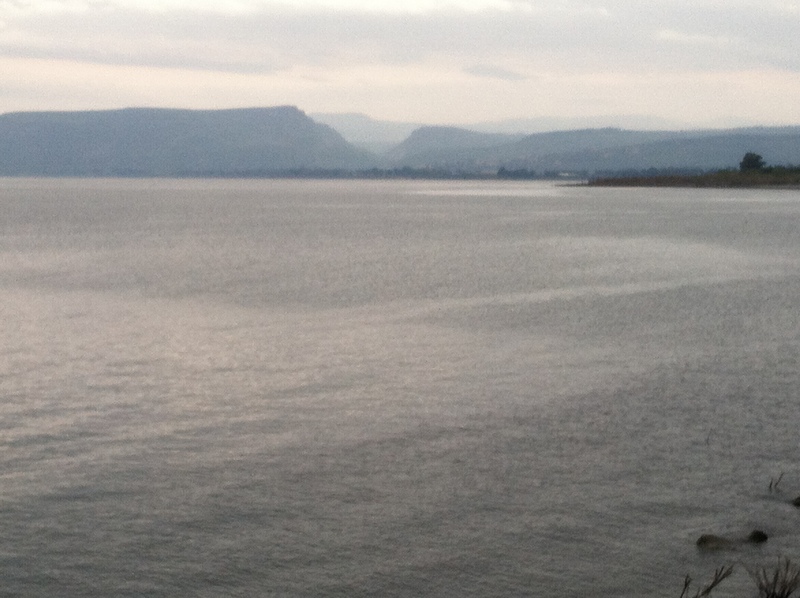 Here’s the view from the beach at Capernaum. And from a boat out on the water, the deep ravine of this valley is even more imposing. As the wind whips up the waves, water swamps the boat. There are no life jackets. There is no Red Cross Certified Swimming Instructor on board, to give the disciples a quick lesson in staying afloat if they are swept overboard, or the boat capsizes. The disciples have at least four fishermen among them, and these men are very familiar with this lake, but their experience has taught them to stay near the shore, where it is safe. They are, quite literally, out of their depth as the threat of drowning becomes real to them. And where is Jesus? Back in the stern, the perfect place to be steering the boat to safety. But that isn’t what Jesus is doing. Jesus is sleeping soundly, lying on a cushion. I’ve always wondered what a cushion is doing on a fishing boat, but the image is very clear. Jesus is sleeping comfortably, unbothered by the storm that is raging around him. After a full day of teaching large crowds, he’s tired. If you’ve ever been exhausted from a long day, you can understand how the gentle rocking of the boat might have lulled Jesus into a deep sleep before the storm hit. Snuggled into that comfy cushion, Jesus is sound asleep. Emily Scott writes that Black Christians “could ask the same questions of predominantly white churches across the nation. Do you not care that we are perishing? Do you not care that children are dying? … Do you not care that church folk, at prayer, are massacred? “In Biblical literature, the sea is where the great chaos monster resides, and going out upon the sea is to be subjected to that fear, that chaos — the closeness of everything we cannot control. For some Black Americans, life is lived out in the midst of that storm. Lived out in the knowledge that your life, the life of a friend, the life of a family member, could be taken in one interaction … gone wrong. And this week, as we have seen, in the refuge of the sanctuary, in the midst of prayer, by a young white man who has made hatred and white supremacy the center of his belief system. “People of color live life in the midst of a storm that they cannot simply step away from our out of. As white people, we have the privilege of seeing the storm from the outside, stepping away when we choose. Here’s the important thing, though. Jesus is the one who rebukes the storm. It’s up to us to have faith that he will do so, and to call on him to act, but only Jesus has power to calm the storm. And he does. Notice that Jesus doesn’t rebuke the disciples. He rebukes the storm. He tells the wind and the water to be still. The storm immediately responds. All is calm. It is here, in the calm after the storm, that Jesus questions his disciples about their fear and their faith. Not in the middle of the struggle, but after he has already calmed the waves. It is in the aftermath of our storms that we must listen most closely for God to speak to us, and it is in the aftermath of our storms that we must allow Christ to challenge us and reorder our way of thinking. Nine people died in a historic Black church this week, gunned down by a young white man wearing symbols adopted by white supremacists. The past twelve months have seen brutality aimed at Black people in rising numbers. These are not isolated, unrelated incidents. Each violent act is borne out of the same sickness that has infected our entire country, the virus of racism. 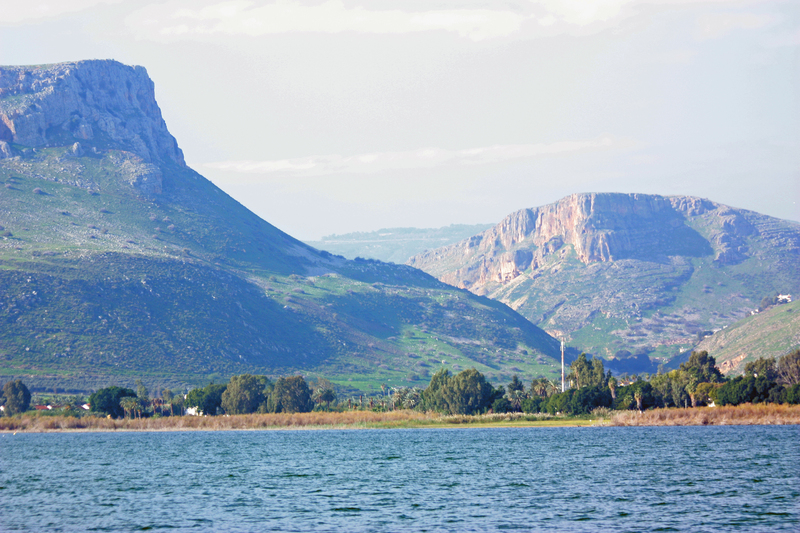 On Wednesday night, half a world away from Charleston, South Carolina, in the little village of Tabgha, on the shores of the Sea of Galilee, another act of racial violence happened, within sight of the spot where Jesus calmed the storm. The Church of Loaves and Fishes was damaged by arsonists. The roof collapsed, and hundreds of books burned in the fire. The beautiful mosaic floors we admired in January, centuries old, are now covered in soot and debris. Police have called it a hate crime. According to news reports “Sixteen yeshiva students, reportedly West Bank settlers, were detained … as suspects in the arson but were released without charge” (http://www.haaretz.com/news/israel/.premium-1.661848). Jewish students are the prime suspects in this “hate crime” against Christians. Wherever people allow fear of the “Other” to set one group of God’s children against another, wherever people allow hatred to grow where love belongs, wherever we turn a blind eye to acts of violence that come out of such hatred, we grieve God’s heart. “Don’t you care that we are perishing?” our brothers and sisters ask us. And only Jesus can stand up and calm this storm. Of course, we face our own storms, apart from those that are stirred up by the winds of hatred within our social systems. Our little boats founder under the crashing waves of sorrow, disrupted relationships, material needs caused by job loss or other financial crisis. Our faith falters, and we have to ask, “Lord, don’t you care that we are perishing?” We are filled with anxiety and fear. But notice that the fear in this story is confronted, not by courage or resolve on the part of the disciples, but by Jesus’ presence alone. In the course of this storm, the disciples never do pull themselves together. They never do grab the tiller and guide the boat to safety, addressing their fear head on. Only the presence of Jesus can calm both the raging storm, and the disciples who are caught in it. Only Jesus can calm our fear and settle the storms we face on a daily basis. When they see Jesus rebuke the storm, the disciples are filled with a new kind of fear. They experience the holy fear of recognizing the presence of God in their midst. They are filled with awe at the realization that this man standing between them and the storm is not just “some guy.” They may not quite yet understand the enormity of what they have just witnessed, but they know that God’s power has just been shown to them in an unmistakable way. That same power is available to us, in the person of Jesus Christ. But we must call on him to act, if we want to be free of the storms that rage in and around us. Notice that Jesus never says, “There’s nothing to be afraid of.” Instead, he asks, “Why are you afraid?” It’s the question form of that familiar phrase we hear whenever God shows up in people’s lives throughout the Bible: “Stop being afraid.” There is plenty to fear, but God is with us. Christ stands between us and the storm. And he calls us to stand with him, and with all our brothers and sisters who face storms of injustice, violence, and hatred, wherever they are in the world. Let us be filled with holy fear, for Emmanuel, our God, is with us. while they were turning to you in prayer. We come to bear their burden in Jesus’ name. for the violence in our streets has come into your house. The hatred in our cities has crept into your sanctuary. on behalf of our brothers and sisters in their mourning. a garment of praise in place of a spirit of despair. how much our world needs the hope that can only be found in Jesus. from following You with our whole heart. Michael L. Lindvall, Feasting on the Word, Year B, volume 3, 166. 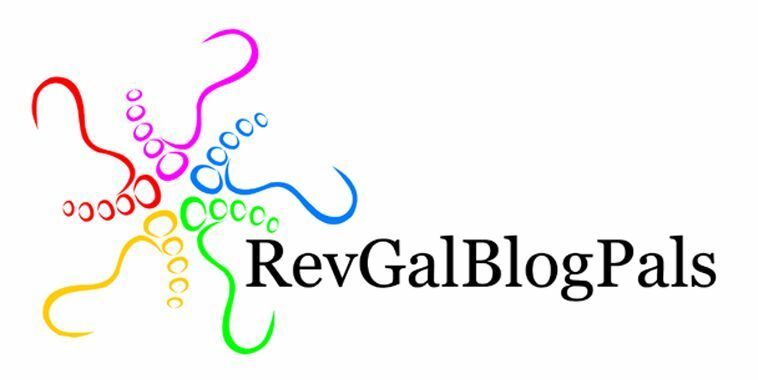 This entry was posted in Discipleship, Sermons, Time after Pentecost and tagged Church of the Multiplication of Loaves and Fishes, Emanuel AME Church, fear, Galilee, Jesus calms the storm, Valley of Doves on June 20, 2015 by pastorsings.